AMERICA HAS more people, but not as many of them turn out to vote. India’s voters are conscientious and far more numerous, but it divides its national elections into seven phases spread over as many weeks, to make the process more manageable. So April 17th, when Indonesia’s 265m people pick a president, parliament and regional assemblies, is likely to be the biggest single day of voting in human history. In the presidential race Joko Widodo, the incumbent, faces Prabowo Subianto, a former general, just as he did at the previous election in 2014. Jokowi, as the president is known, is a small-businessman and former mayor from a mid-sized city who has worked hard to improve the lives of poor Indonesians. He has rolled out a national health-insurance scheme, pumped money into education and broken ground on lots of new infrastructure projects. Although he has not raised the growth rate to 7%, as he promised, his focus—development—is the right one. Mr Prabowo casts himself as a strongman, an unnerving pitch given that, as a general, he defended his father-in-law, Suharto, Indonesia’s dictator from 1967 to 1998. He promises to be more of an economic nationalist than Jokowi, and to make Indonesia great again. He has courted radical Islamists, doubtless hoping to capitalise on false rumours spread by social media that the president is a closet Christian or communist, a dangerous ploy in the world’s biggest Muslim country. His election would be a step backwards for Indonesia’s 20-year-old democracy. It is heartening, therefore, that most polls show Jokowi firmly in the lead. But that does not mean, unfortunately, that Indonesia’s democracy is healthy. 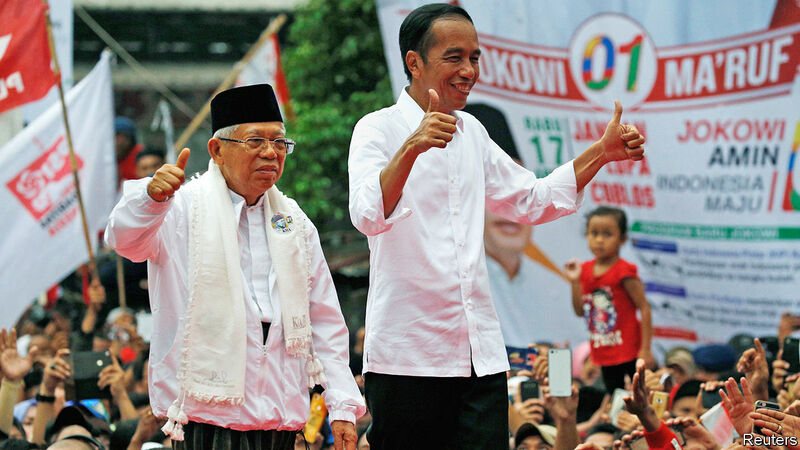 For one thing, Jokowi has made himself the front-runner in part by imitating some of Mr Prabowo’s tactics (see article). He has nationalised a big gold and copper mine, and boosted spending on wasteful fuel subsidies he had previously cut. He has surrounded himself with generals with chequered pasts, such as Wiranto, who was head of the armed forces when East Timor voted for independence in 1999, prompting militias backed by the army to go on a rampage that claimed 1,400 lives. Jokowi has also shown scant regard for civil liberties when it suits him, standing by last year as the authorities found excuses to block lots of rallies by an opposition movement called “GantiPresiden” or “ChangePresident”. Indonesians might have been inclined to change their president if they had more of a choice. But Jokowi’s party, PDI-P, and the other big forces in politics have colluded to narrow their options. To run for president, a candidate must have the backing of parties with a fifth of the seats in parliament—a rule the president used to ensure Mr Prabowo was his only challenger. The threshold for parties to enter parliament has been steadily ratcheted upwards over the years, from 2% of the national vote in 2004 to 4% now. That is likely to trim the number of parties represented from ten to six or even four. Not that parties mean that much. After an election they all seek to join the president’s coalition, in order to win plum ministries and thus be able to hand out jobs and contracts to their allies. In fact, the only real ideological cleavage in Indonesia is between secularists and those who feel Islam should play a bigger role in public life. It is in this sense that Jokowi’s record is most disappointing. When a close political ally, Basuki Tjahaja Purnama (Ahok), the governor of Jakarta, was maliciously accused of blasphemy, Jokowi did not defend him. Instead he affected greater piety himself, praying with the protesters demanding that Ahok should be put on trial. As his running-mate in the current campaign, Jokowi has chosen a conservative cleric who testified against Ahok in court, helping condemn him to prison. The choice sends an appalling signal to the 12% of Indonesians who, like Ahok, are not Muslim. Jokowi’s instincts are secular. He has used his authority as president to ban one extremist group and thwart others. He is a heavy-metal fan; his wife does not wear a headscarf; his party is popular with religious minorities. But he clearly does not feel confident enough, despite his lead in the polls, to stand up to the zealots. The lesson they are learning from his tenure is that they can get their way through bullying and intimidation. Most Indonesians, by and large, understand the distinction between piety and intolerance perfectly well—and reflect that in their votes for moderate parties like the PDI-P. But their moderation will be to no avail if politicians, starting with Jokowi, are not willing to stand up for Indonesia’s long tradition of tolerance.